Twenty years ago I purchased my first road bike. It was a 1994 Specialized Allez. Now about that time, the bike industry had hit the zenith of its torrid love affair with gaudy colours (true, logos had yet to grow to the gargantuan sizes seen on today’s moulded carbon frames, which depending on the weather conditions, can be seen from low earth orbit ). The whole “purple anodize” craze had died down somewhat, but manufacturers en mass decided to spice up tyre products with colours. Black was too boring, too 1989. So that Allez came with grey treads, the Specialized Turbo Team in Umma Gumma Grey. Twenty years later, I still remember those tyres….remember them as the shittiest tyre I rode. You see, tyres are black for a reason: carbon black is used as a filler, which gives the vulcanized rubber toughness and UV/chemical stability. Without carbon black, those tyres might grip well, but they wore away super fast. And they punctured like no one’s business. 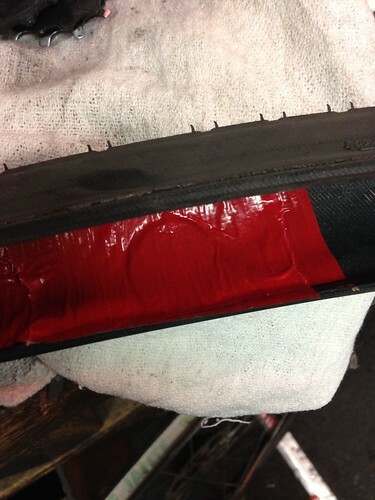 As my introduction to road cycling, I didn’t know better tyres existed. I thought all road cyclists just learned to deal with multiple flats per ride. With the amount of practice I was accumulating, I learned to fix flats right quick. The casing ripped rather easy too. As a poor yet moderately clever university student, I devised a way to make cheap and lasting tyre boots. Step one: get an empty, plastic soft drink bottle. Even back then, I had an insane cola addiction, so there was never a shortage of raw materials. Step two: cut a small oval of the plastic, about 15x10mm. 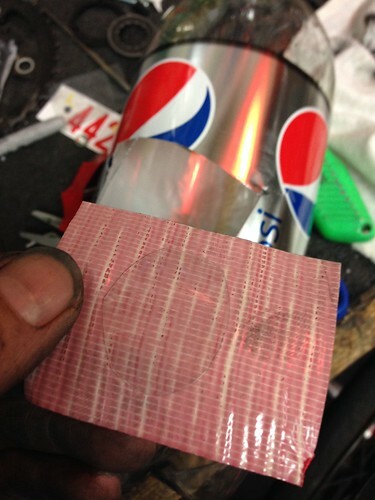 Step three: apply a piece of duct tape to the concave side of the plastic. The duct tape should have a 8-10mm border around the plastic. Step four: make a few more of these and then stick them to a bigger square of the cola bottle plastic. 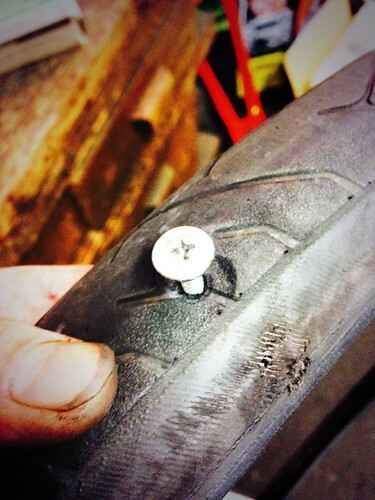 Keep this square in your on-road repair kit, and peal off the tyre boots as you need them. These work better than a dollar bill or energy bar wrapper because the plastic is better at resisting bulging through the hole in the tyre casing, even at the high pressures of skinny road tyres. Also, the tape will keep the boot from dislodging, so it’s a semi-permanent fix. I devised this trick out of necessity, because those Umma Gumma tyres tore for any random reason. With today’s tyres that use better, non-carbon fillers (silica) and better casings, I don’t bother carrying a card of my ready-to-apply tyre boots with me except on longer tours, but I often use these boots whenever a customer has a largish hole in an otherwise still-good tyre.